Whilst you can get away without a poker table top, the one thing you do need for a poker night at home or at a friend’s house is a poker chip set. There are so many poker chip sets with different prices, different materials and different marketing from clay poker chip sets to professional clay poker chips to good quality poker chips. So how do you decide to buy poker chips? This article sets out the 6 best poker chips for sale and explains the best poker chip weight. 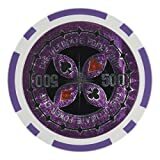 Stated on Amazon as ‘the UK’s #1 500 poker chip set’ it’s good to see it comes with heavier 13.5 gram poker chips which have clear numbers in the middle at home poker tournament useful denominations of 25-50-100-500-1000-5000. The 5,000 chip roll is great as allows for deepstack home poker games. 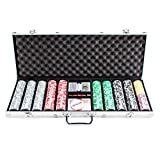 This is a decent quality 300 piece chip poker set with 11.5 gram chips plus two decks of playing cards as well as a dealer button, all contained in an aluminium hinged case. Premier Poker Chips is a Cambridge based company with a large selection of poker chips from clay poker chips uk to a luxury poker set. You can get a sample pack of their super heavy 14g Crown Casino Royale Poker Chips which contains all 8 chips and are made from a clay composite material. Chips area said to have a ‘pleasing clunk when rifling’ which we can vouch for to the annoyance of colleagues near our desk! This is a whopping great value 1000 chip set but is more on the expensive side due to excellent 14 Gram Heavy Weight Poker Chips which are Casino Grade Clay Composite. But just look at the chip tray box, it’s a thing of beauty. This 500 chip set is lower priced but still comes with heavy 14-gram poker chips which are pressed with a top-quality, casino-grade clay composite that feels great to not only shuffle but also stack it high! The chips come with laser-etched inlays catch the light to add some bling to your games! On the budget end are these 11.5g acceptable 500 piece chip set that is marketed as ‘Claytec for a better feel but not actual clay. They are housed in a silver aluminum case and comes with two decks of playing cards plus not only a dealer button but also a big blind and little blind buttons.